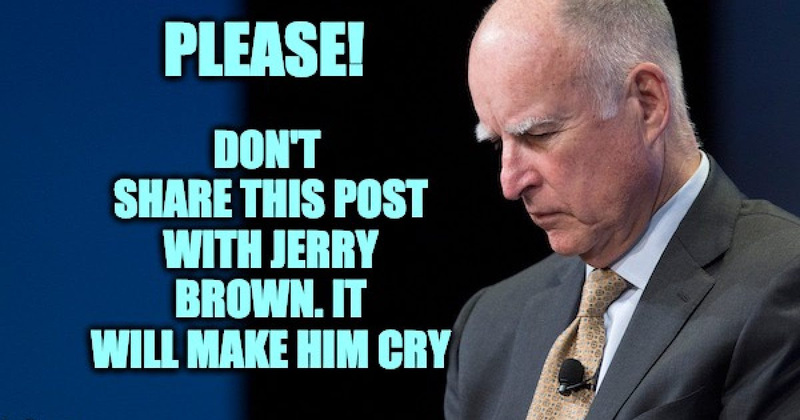 Whatever you do PLEASE don’t pass this post to Al Gore, or former California Governor Jerry Brown, it will make them cry. You see, U.S. District Court Judge William Alsup ruled that equipment owned by the utility company Pacific Gas and Electric was the cause of some wildfires due to tree limbs and other debris knocking uninsulated power conductors together, NBC News has reported. But wait, former California Governor Jerry Brown also known by the nom de plume of Governor Moonbeam insists the California wildfires were caused by global warming. “This is kind of the new normal,” he said, adding that extreme fire activity will happen on a regular basis for decades. But if the judge is blaming PG&E’s HV distribution lines, then warming had nothing to do with it. The scaremongers’ claims of wildfires being tied to climate change is a denial of science. 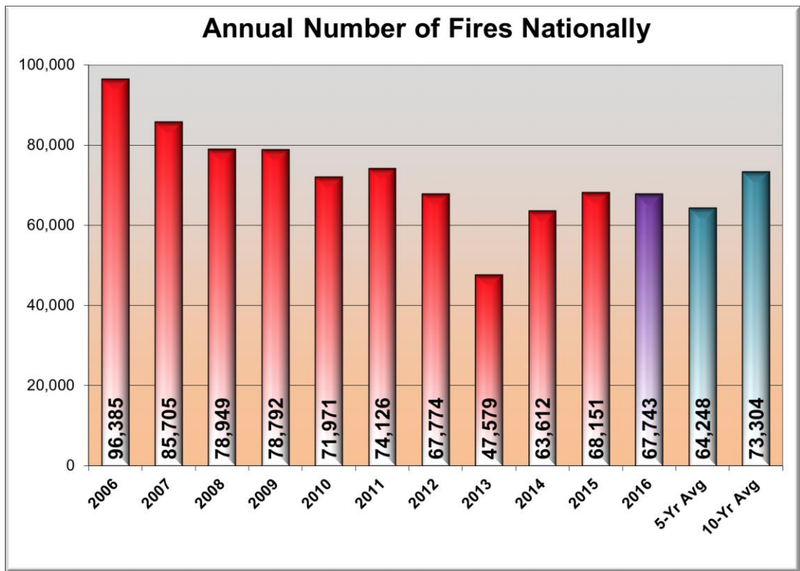 Taking a look at the trends through 2016 via the federal government’s National Interagency Coordination Center, there hasn’t been a spike in US wildfires, in fact, the five year average of 62,248 fires/year (the next to last bar on the right) is lower than the ten year average of 73,304 fires/year. An indication that the number of wildfires has been decreasing (sorry Governor Moonbeam). Why would anyone believe what Dan Rather says anyway? He also believes he shouldn’t have been fired for what turned out to be the largest, most damaging journalism scandals from the time television began broadcasting news began to recent times when the MSM started to lie about Donald Trump. Before the Russians tried to influence the 2016 election, Dan Rather presented a report that was an out and out lie, and almost changed the results of the 2004 presidential election. Why aren’t the HV wires insulated? Well, they kind of are, by air. Air is a poor conductor of electricity and is free—power company’s favorite cost. Unlike regular wires, high voltage distribution lines contain high levels of energy. A very thick insulation would be needed to prevent the insulating material from catching fire. But a very thick insulator would reduce the current carrying capacity, thus defeating the purpose of the high energy power line in the first place. Additionally covering the miles of HV wires with insulation would be too expansive. Scott McLean, deputy chief of communication for the California Department of Forestry and Fire Protection, said his agency has determined that the utility is at fault for 12 of 17 fires in 2017; it has not yet made conclusions about 2018’s fires, including the deadly Camp Fire in Butte County. Based on the Judge’s tentative ruling PG&E’s engineers might want to look at improving the safety of their HV wires in forested areas.